Dig into the minds of 800+ IoT developers and professionals. We’ve all witnessed the growth of IoT over the past decade. How can we optimize our position to maintain and continue this growth? By giving developers the tools they need to create these IoT technologies! In preparation for the upcoming “Guide to IoT: Applications, Protocols, and Best Practices,” we surveyed the DZone audience of developers and professionals to get a better grasp of the IoT industry. The survey asked about their work experience, preferences on various programming languages, their roles as a developer, and what software they are working on. Stay tuned for the complete and comprehensive survey data, which will be published in our Guide to IoT. More than 30% have 16 to 25 years of experience. 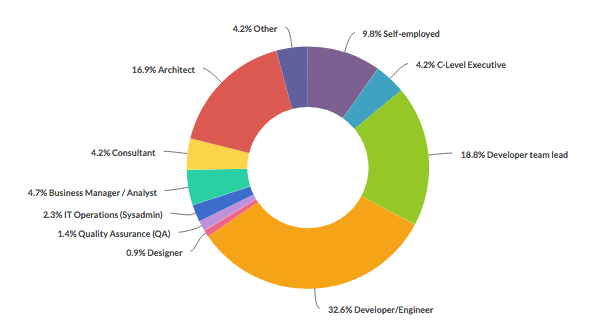 Primary job roles: 32.6% are developers/engineers, 18.8% are developer team leads, and 16.9% are architects. 22% work in company’s with 10,000+ employees, followed by 21.1% in companies between 1,000 and 9,999 employees. More than 85% of professionals said that they read articles on multiple tech sites to keep up their skills up to date. 55.1% of professionals say that their company’s primary coding language is Java, followed by Python at 8.4%. 88.8% said they believe IoT will be relevant to their organization in the future. 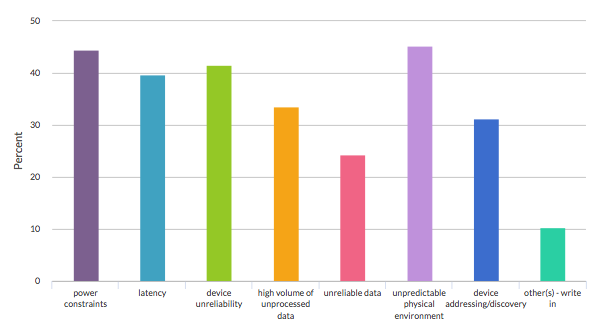 45.3% of developers said that an unpredictable physical environment is their largest challenge, followed by power constraints and device unreliability. Companies are struggling to crack down on security for their applications.This issue has opened the door for many companies to innovate, creating products and procedures to help IoT companies keep their data safe. The use of AI and machine learning is on the rise. From new products to the new jobs are needed to execute their growth. Everyone is interested in how artificial intelligence will make its way into the IoT realm and what changes will be made to what developers are doing now. Understand how to collect data and learn from it. Knowing the right questions to ask will allow organizations to get more out of their data and be in a better position for success. Who owns the data? Not only have developers had to keep up with the rapid changes in the IoT space, but they now have to learn how to manipulate it in many ways for many different people.